As readers may already be aware, the Canadian Initiative for Outcomes in Rheumatology cAre (CIORA) is a unique granting division of the CRA committed to acting as a catalyst for improving the care of Canadians living with all rheumatic diseases. 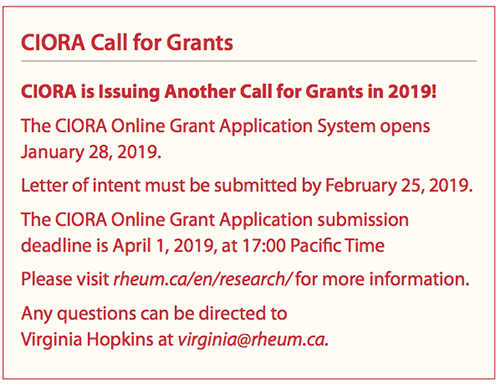 CIORA’s grant program supports sustainable projects related to rheumatic diseases that promote: (1) awareness/ advocacy/education (including health economics/sustainability of health care/quality improvement); (2) Early access for rheumatic disease patients; and (3) Multi-disciplinary care teams. For this issue of the CRAJ, the CRA surveyed its members on CIORA. While most respondents (approximately 80%) were familiar with CIORA grants, there were some who were not. For those who had never applied for a CIORA grant, when asked to explain why, most answered by saying that they either did not do research or that CIORA’s granting categories did not encompass their particular area of focus. However, 85% of survey takers felt that the CRA should better inform the membership of what CIORA-funded research has been used for. Suggestions on how the CRA could disseminate CIORA information to its membership included featuring summaries of CIORA-funded work in the CRAJ, in the CRA e-newsletter, on its website (rheum.ca/research/ciora/) and with a presentation at the CRA ASM. Indeed, the current issue of the CRAJ features an article from Dr. Zahi Touma, the recipient of the 2018 CRA-CIORA-Arthritis Society Clinician Investigator Award, in which he discusses how the award will help him further his research on cognitive impairment in systemic lupus erythematosus (SLE) (click here to read the full article). Recently, in the summer 2018 issue, the CRAJ also featured Dr. Bindee Kuriya and her work on the risk of self-harm in patients with rheumatoid arthritis (RA) and ankylosing spondylitis (AS) (click here to read the full article). The CRA also asked its members if there are any other research-related activities that they would like the CRA to pursue. Suggestions from members included focusing on quality improvement (QI) activities, patient-centred care, models of care, non-CIHR funded topics, community-based initiatives, education related to rheumatology, non-pharmacologic management of diseases, sponsoring a national biobank, connective tissue diseases (i.e., lupus), imaging/ ultrasound (in the assessment of rheumatic diseases), and medical cannabis. While many of the members commented on their support and appreciation for CIORA, some members did express frustration, citing that the CIORA grants were very competitive, the difficulty in fitting proposals within the three traditional pillar topics, as well as a lack of focus on discovery research. While there is room for improvement, other members noted that CIORA has filled an important gap in the arthritis research landscape, and that many CIORA-funded projects have either achieved their intended objective or allowed researchers to get started and obtain further funding from other agencies.